It’s hard to pin down the right gifts for a guy who never wants anything, but by playing to your hubby’s favorite things to do, you can easily find the right present for him on this list on any sort of budget. Whether he’s jumping up and down in joy for the release of the new Star Wars film, or currently planning his next outdoor adventure, the perfect gift idea is just a paragraph or two away! If your husband loves clothes more than you, and looks coiffed on the daily, it’s probably safe to say he’s a fashion forward guy. Instead of racking your brain coming up with clothing items he doesn’t already have and braving overcrowded malls, get him a clothing subscription box. Each month, he’ll get a new shipment of shirts, accessories, or what have you. Side note: Conversely, this is also a great gift idea for those guys who need a little bit of help in the fashion department—no more sweats and raggedy old college t-shirts for him. If your guy is a modern man, you can’t go wrong with the latest gadgets and trendy décor pieces. Help him decorate his office with art made of modern materials like concrete and metal, or give him practical tools that will make the work day more productive—while giving his desk a stylish, suave appeal. If he enjoys gadgets, you’ll definitely find something from these modern designed gift ideas that he’ll want to show off to all of his friends. If your hubby loves nature, plan the camping trip of his dreams in a nearby national park. Try and plan as much as you can on your own (hint: is there a hike he’s been dying to try? ), and let him know about your plans on Christmas morning—he’ll need to help make sure you have all the necessary materials and have something to look forward to. He will love that you’re willing to take part in something he loves and you’ll get to bask in the glory of Mother Nature. Make sure to plan this trip for spring, when temperatures warm up and the snow is gone, as much for your sake as his! Is your fella the quintessential foodie? Then your gifting options just got a whole lot easier. If he’s a snacker, you can sign him up for a delivery from Graze to his work, where he’ll get a collection of eight different treats based on his favorite snacks that you input when you sign up! Easy peasy and it’s a gift that keeps on giving. You can also delight him with some strange food offerings that he’ll love to sample. Maybe it’s scorpion flavored vodka for the party guy, or peanut butter flavored coffee for the hubby who can’t go to work without at least two cups in his system. If the right song brings a tear to your hubby’s eye, or he has a vinyl collection that seems to reproduce daily, find a music-related gift sure to delight. Look at Ticketmaster.com and find out if any of his favorite bands or solo artists are coming to town soon and grab a pair of tickets. If that’s out of your price range this Christmas, consider buying him a new set of headphones so he can get down to his jams at work or at home. For a musical gift tinged with humor, grab your guy a shower speaker set—waterproof and easy to attach to the wall, be prepared for the love of your life to start belting out his favorite hits in the shower. If your hubby has had a rough year at work and could do with some destressing, plan a gift around relaxation. If he’s open to massages, get him a gift certificate and attend with him for a couple’s package that will have you both feeling relieved. Maybe he wants a more active approach to relieving his stress. If he needs to let out some pent up energy, grab him a gift certificate for a fun day at a martial arts studio or boxing gym. 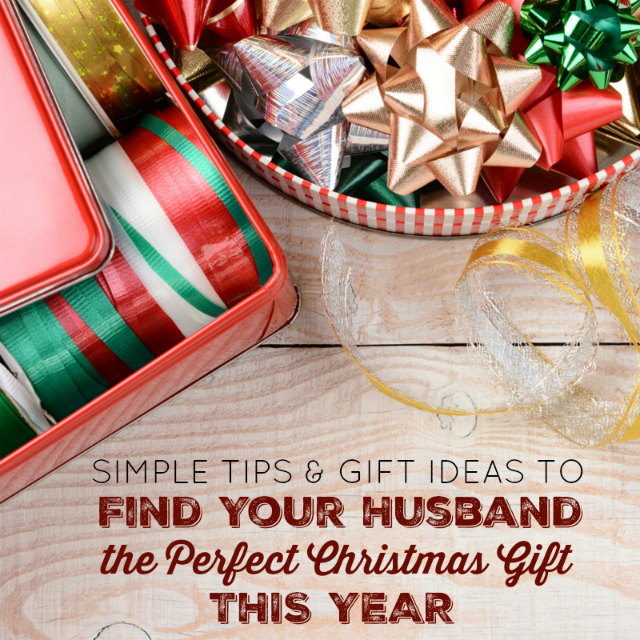 With these ideas, you’re sure to impress your husband when it comes time to unwrap gifts this year!